The controls that inherit from ItemsControl are controls that support a collection of objects. These controls can be used to display a collection of objects on the screen. 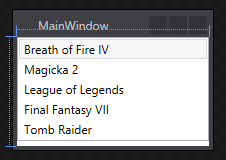 For example, controls like ListBox and ComboBox can be used to allow the user to select an object from a collection. This entry was posted in General and tagged c#, controls, itemscontrols, wpf on March 11, 2015 by BrunoLM.